♣ Malika Aït-Mohamed Parent wrote an article on « The role of compliance in the fight against corruption in aid and in particular in the humanitarian sector », posted on the website of the International Anti-Corruption Academy. ♣ Our expert, Jean-Pierre Méan, was one of the speakers at the PECB Insights conference which took place in Paris from 24 to 26 October. ♣ Jean-Pierre Méan was a speaker at a conference and seminar organized in Tunis on 16-18 October 2018 on : « Les entreprises tunisiennes et les défis de la bonne gouvernance et de la gestion de l’intégrité: Exigences locales et tendances internationales – Tendances émergentes et nouveaux outils de gestion de l’intégrité et de la bonne gouvernance: La norme ISO 37001 ». 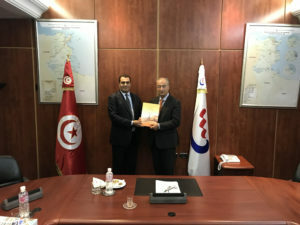 On this occasion, he met the Chairman and Chief Executive Officer of the Tunisian Electricity and Gas Company (STEG), Mr Moncef Harrabi. 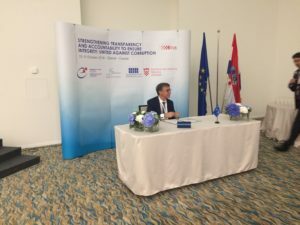 ♣ Our expert Francesco Clementucci reports that on October 16th, an Integrity workshop was held in Sibenik (Croatia), organized by the Croatian government together with GRECO (Group of States against corruption, body of the Council of Europe). During the event the Declaration for the creation of the international network of agencies for the prevention of corruption was signed. The initiative, promoted by the Italian Anti-Corruption Agency (ANAC), is the result of an activity undertaken by the Agency following the PACE report for the promotion of integrity (of 2017). One of the its recommendations was to set up a European network as an effective tool to achieve a more harmonized and effective prevention of international corruption risk. 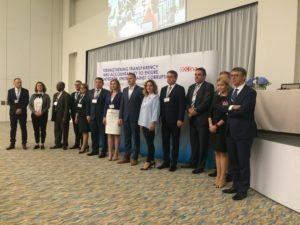 The goal of the network is to provide parties with a forum for the recognition, promotion and exchange of best practices for the prevention of corruption, with the possibility to exchange information and recommendations. The newly established coalition is also aimed at bringing greater attention to prevention, creating a cohesive group of institutions committed to achieving common interests in a specific area. So far, 18 countries have signed the Declaration: in addition to Italy, also France, Croatia, Slovenia, Slovakia, Albania, Greece, Montenegro, Romania, Serbia, Moldova, Azerbaijan, Bosnia, Estonia, Luxembourg, Denmark, Benin and Ukraine. 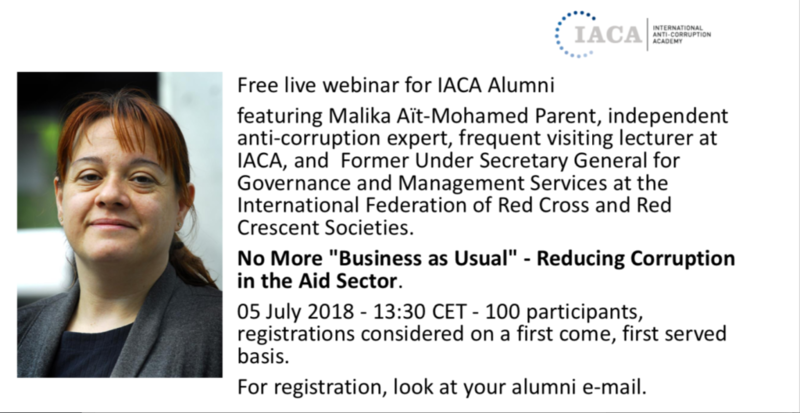 ♣ ACE expert Malika Aït-Mohamed Parent has taken part in a panel discussion on Corruption and Aid at the International Anti-Corruption Academy in Vienna on 28 September. 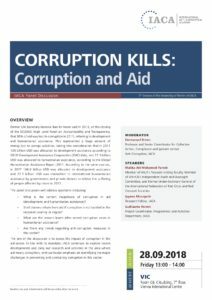 ♣ Transparency International, the Berlin-based global anti-corruption organization, has just released its twelfth progress report (the 2018 Exporting Corruption Report) on the enforcement of the OECD Convention on Combating Bribery of Foreign Public Officials in International Business Transactions (the OECD Convention) . This report follows on 11 reports published annually from 2005 to 2015. It is an occasion to reflect on what has been achieved by the OECD Convention so far and what more can be expected in the coming years. But first, what is the OECD Convention and where does it come from? 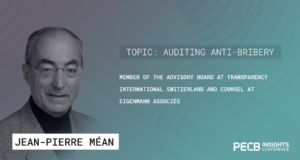 J.P. Méan commented this report in a blog of the University of Ottawa’s Canadian Center of Excellence for Anti-Corruption (CCEAC) : Where do we stand 20 years after the OECD Convention was signed? (Sep 13, 2018). 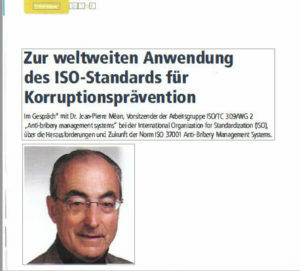 ♣ Jean-Pierre Méan was interviewed by the German compliance magazine Comply. His interview is published on pages 28-29 of issue 3/2018. 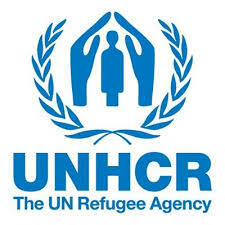 ♣ Malika Aït-Mohamed, one of the anticorruptionexperts.com experts, has been appointed a member of the UNHCR Independent Audit and Oversight Committee. This Committee serves in an expert advisory capacity to assist the High Commissioner and the Executive Committee in exercising their oversight responsibilities in accordance with relevant best practices, industry standards and the financial and staff regulations and rules applicable to UNHCR. It provides external, independent, senior-level advice regarding the functioning of audit and oversight in UNHCR; reviews internal and external audit and oversight matters; and reviews financial management and reporting within the Office. This manual provides methods and options based on good practices to improve transparency, accountability, and integrity in the regulatory licensing process and integrity due diligence. It borrows models from the Basel Core Principle ‘fit and proper’ concept, and provides options for conducting effective (a) beneficial ownership; (b) criminal/legal; and (c) conflicts of interest checks, with a goal of integrating these into the regulatory licensing process. It also identifies common legal framework defects that can facilitate corruption risks, and offers options based on principles of regulatory integrity to reduce these risks. The good practices identified can help countries allocate limited financial resources in conducting thorough background checks in a cost-effective manner, as well as meet EITI’s requirements for public disclosure of beneficial owners and politically exposed persons. 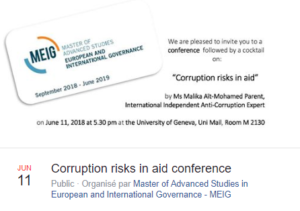 ♣ Malika Aït-Mohamed Parent spoke on Corruption Risks in aid on 11 June at a conference organized by the Master Program in Advanced Study in European and International Governance. ♣ Jean-Pierre Méan attended the meeting of the Commission on Corporate Responsibility and Anti-corruption of the International Chamber of Commerce in Paris on 30 May 2018. ♣ Jean-Pierre Méan attended the AGM and the Steering Committee meeting of the Aluminium Stewardship Initiative (ASI – https://aluminium-stewardship.org), on 21-16 May in Perth Australia. 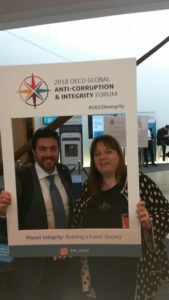 ♣ Malika Aït-Mohamed Parent and Franceso Clementucci, two of our experts, attended the OECD Global Anti-Corruption and Integrity Forum (Paris, 27-28 March 2018), focusing on « Integrity Planet ». Malika spoke as panelist on corruption risks in aid as part of the Panel « Managing Corruption Risks in Development Co-Operation in Contexts of Fragility ». They met with a number of peers in the community of corruption fighters. ♣ Jean-Pierre Méan (second row, center) attended the meeting of the iSO Committee on Governance of Organisations in Quebec City in May 2017 and was the Convenor of the meeting of the Ad Hoc Group on Anti-Bribery Management Systems (subsequently transformed into a permanent Working Group). 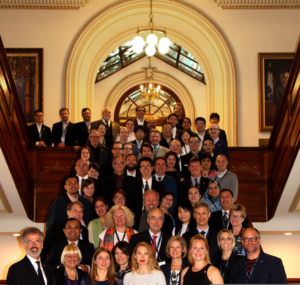 As a side event, the Committee visited the Quebec National Assembly building where this photograph of the attendees was taken. ♣ Malika Ait Mohamed Parent held a speech on 10 May 2017 at a lunch meeting in the Swissôtel Metropole in Geneva, about Anti-Corruption in Non-for Profit. Launch of the new anti-bribery / anti-corruption self-assessment online tool: where does your organization stand? How to recognize the tone from the top? What makes the corrupt tick? How does nepotism relate to bribery? Is a tip a bribe?